Tigers, Pirates and sharks got you down? Help is on the way. Dennis Rogers is the ultimate guide to Rook Island. Not only does he know his way around, he can teach you to fight back. But Dennis is more than useful backup, he’s the key to the Path of the Warrior and the gateway to the mysterious Rakyat tribe at the heart of the jungle. 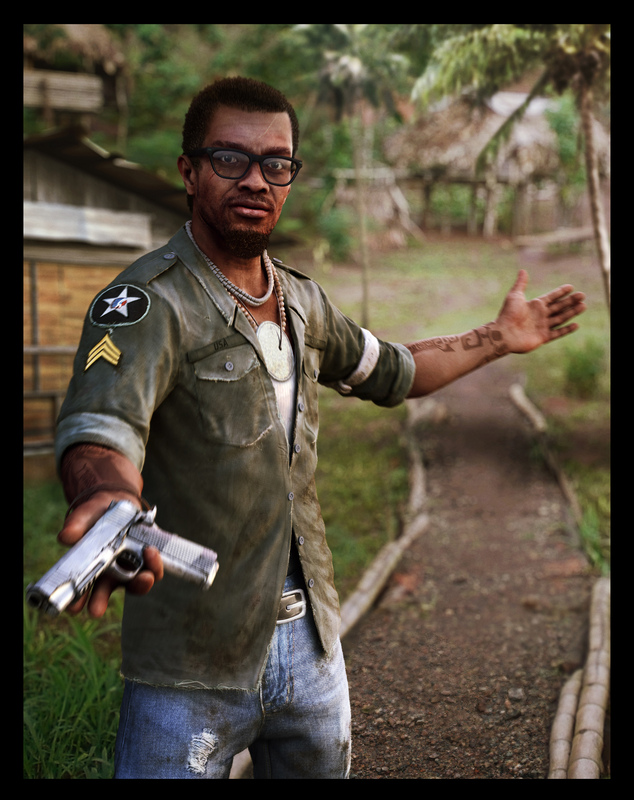 Born and raised in Liberia, Dennis was no stranger to war and poverty. Seeking a better life, he eventually left his homeland, immigrating to America. But ten years later, he left, disillusioned. He returned to Liberia, but discovered he no longer fit. He was lost. After drifting from job to job he found his way to Rook Island and Citra. He embraced the Rakyat cause and proved himself as a dedicated warrior. But, it will be up to Jason to prove that he can deliver, rather than end up under Vaas’s knife. For some reason, ‘Acid Queen’ starts playing in my head when I look at this picture. Known to the Rakyat as their warrior priestess, goddess and their queen, Citra is cloaked in the mystery of old ritual. Only the warriors deep in the jungle have seen her, far fewer have spoken with her. Charismatic and beautiful, she hungers for the power denied her people by the pirates and privateers tearing apart her island. The destiny of the Rakyat has been foretold by those at the beginning of time and Citra will see that destiny fulfilled. 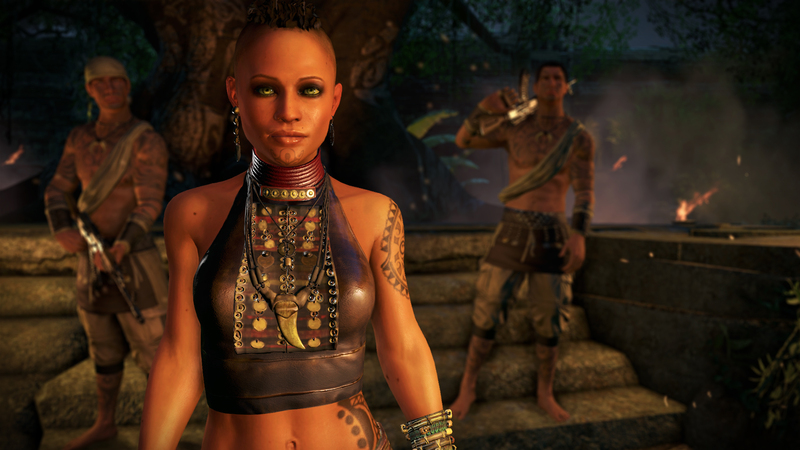 After her brother, Vaas, deserted the tribe to join the pirates, she vowed to crush him. Her warriors wage a fierce battle against the pirates daily. Never wavering in her resolve, Citra has ordered the execution of countless pirates. The Rakyat live to fight and she exists as the purest manifestation of the spirit. From atop her temple stronghold, she leads the charge. When Jason is ready, Dennis will introduce him to Citra. She has the ability to unlock great power within him. The path will be plagued with danger, but if Jason wants to defeat Vaas, it may be the only way to come out on top. As he progresses, Citra sees more in him than a great warrior, she sees a kindred spirit. Posted on October 10, 2012, in Trailers and tagged Far Cry, Far Cry 3, PC, PS3, Q4 2012, Ubisoft, Ubisoft Montreal, X360. Bookmark the permalink. Leave a comment.